Women’s beach hat is one of the most essential items that you need to pack with you when you go travelling on a beach vacation. 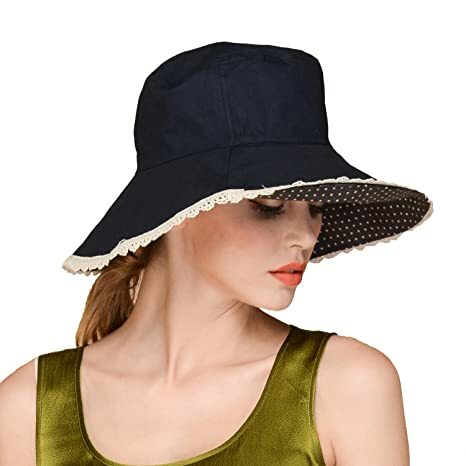 Not only does a beach hat make you look elegant and beautiful but it also protects your sensitive skin from the harmful elements of the harsh sun rays. When you go searching for a women beach hat on the market, you will come across thousands of choices in different styles, materials, and designs. It can be a very challenging task if you want to find the most suitable beach hat among all of them. 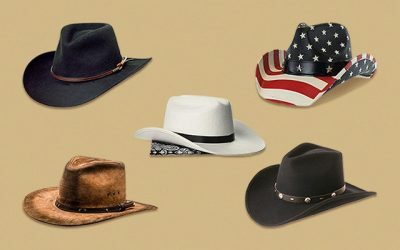 It is critical that you can choose one which is made of the premium quality with a solid construction (Other tips on choosing a particular hat is included in this article ).Check out our guide below for the best among the best- to find the one that would make you feel comfortable and look stylish at the same time. Its Main Features: This floppy beach hat is made of 100 % of cotton. The most significant feature of this hat is the wide brim, much wider than other wide brim hat that you can find on the market. This hat also includes a bow which you can remove if you don’t like it. There are various options of colors including blue, beige, red, and grey as well as 2 flowery patterns for you to choose from. As I mentioned above, the brim of this beach is that it is wide. It is wide enough to provide a lot of coverage for your face as well as your neck and your ears. In addition, it is crushable and packable so that you can easily bring the hat around when you go travelling. Another thing about the brim is that it comes with wire built inside the outer edge of the brim. Hence, it can help to keep the structure of the brim and doesn’t make it too flimsy. Not to mention that you can easily change the shape of the brim to form the style that you want with this hat. The material of this hat is of premium quality. The fabric is rated 50 + UPF to effectively block the harmful sun rays and protect your skin. Moreover, the material is lightweight and breathable. The inner headband is effective in term of wicking moisture away and keeping your head cool all of the time. While the hat is available in 1 size, it has an internal adjustable drawstring that makes the hat stretchy and elastic so that it can fit your head more comfortably. The problem with this hat is that the brim is so wide that sometimes it can become sloppy, blocking your view in case of a high wind. In addition, there is no chin cord to help keep the hat stay secured on your head when it is windy outside. So while this hat is ideal for a sunny day, you might consider not wearing it in a cloudy yet windy day. 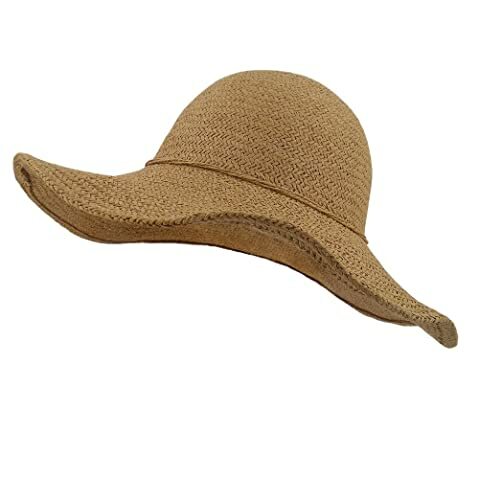 Its Main Features: This straw beach hat is made of 100 % of straw for a natural looking beach hat for women. There are 12 options of colors for your consideration- from pink, orange, to blue and yellow. There is a ribbon of contrast color attached to the hat. The width of the brim is 3 inches and the height of the crown is 4 inches. 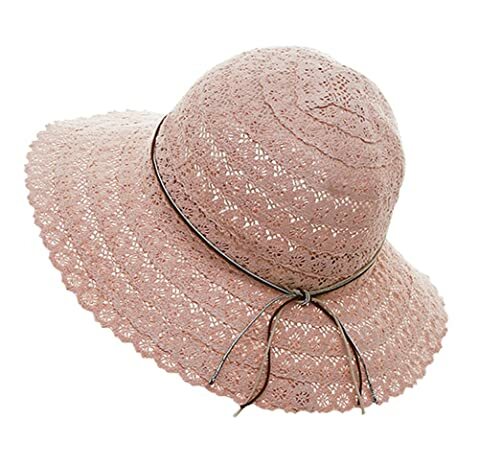 This hat is made of the premium natural straw hat, which means that this hat is among the most lightweight and breathable beach hat for women that you can find on the market. There is a cotton sweatband attached on the inner side of the hat to make it more comfortable for you to wear the hat. Furthermore, the straw of the hat is woven nicely and tightly so that it can effectively block the harmful sun rays. It is rated 50 + for the UPF to prevent sun burn and other skin damages for you. Last but not least, the hat is well made for a firm and solid construction. You can fold the hat and put it into a small bag. When you take it out, it will spring back to its original form. There are many choices of colors for you to choose from. And since it is available in solid colors and simple designs, you can wear this summer beach hat not only when you hang out by the beach but also with other pieces of your casual clothes in your daily life. Remember that with the natural straw hat, the only way to take care of the hat is to wash it by hand with cold water only and then let it dry naturally. 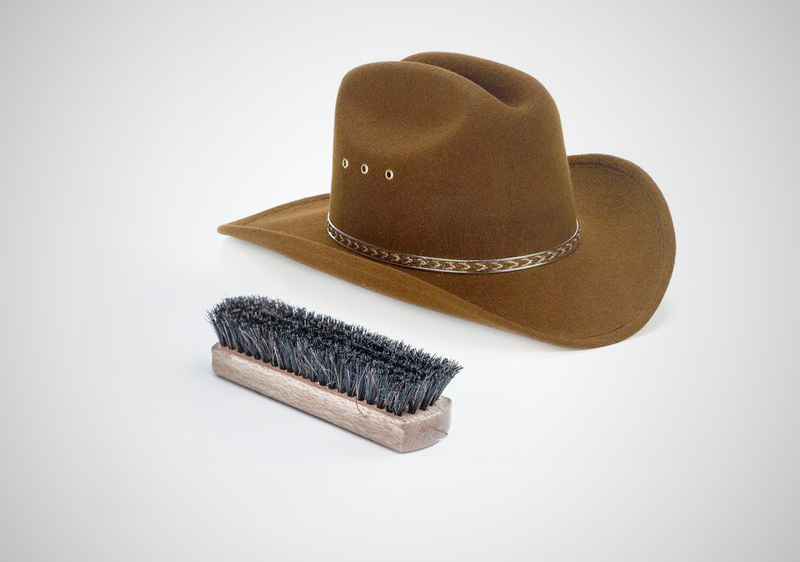 For more tips on cleaning a straw hat, check out this article here. Its Main Features: This girl’s beach hat is made of 100 % of paper straw. This hat will attract your attention with its unique design. There are 2 designs in 1 hat. One, you have a normal straw beach hat. Two, you have a different look when you take out the removable crown. The brim of the hat is 5 inches in width. First of all, this hat is made of the premium quality. Like other high quality straw hats that you can find on the market, it is cool, breathable, and lightweight. Since the fabric of this hat is soft, you can easily fold it and pack it for easy storage and carrying around when you go travelling without worrying that you might damage the material of the hat. The brim of this hat is wider than some other paper traditional straw hats. Hence, it would be able to provide a lot of protection for a wide area of your face and your neck. While this hat is available in 1 size, it comes with a Velcro closure on the back of the hat for you to adjust for the best fit. In addition the headband of this hat is super elastic so that your forehead will not feel irritated at all when wearing the hat. Not to mention that this hat can be worn in 2 different styles for you to change during your trip. And in case you tie your hair in the ponytail style, you will feel more comfortable when removing the crown of the hat. Finally, the color of this hat is very vibrant and solid. It is also fade resistant so that it would remain in the same shade of color even after you have been wearing the hat for a long time. Its Main Features: Like other straw beach hat women’s, this beach hat is made of the 100 % of high quality straw featuring the woven style. The height of the crown is 5.1 inches while the height of the brim is 4.7 inches. It is available in 1 size with 2 options of colors- including khaki and beige. With the weight of only 4 oz, this beach hat is one of the lightest hats made from straw that you can find on the market. The material is also of the premium quality for a soft and breathable hat for you to wear in a hot summer day. The hat is made with an exceptional craftsmanship. It is tightly woven for a solid construction that can last for a very long time. The brim of this hat is wide enough to provide a lot of coverage for your face. Also, there is an inner wire running along the outer edge of the brim. Hence, you can reshape the brim, upward or downward-whichever way you like. In addition, the brim can stay firm and solid in case of a high wind. You can also fold the brim and pack the hat into a small bag for easy storage and carrying around. It will always spring back to its original form, unless when you press the hat too hard. This hat can be worn not only when you to go the beach. Thanks to its solid and timeless design, you can have it when you go camping, taking part in race day event, gardening, or any other outdoor activity. Its Main Features: If you are looking for feminine looking and cute beach hats, this hat can be your ideal choice. It is made of 100 % of cotton. It includes a wide brim and a detachable chin cord. There are 2 sizes for you to choose from, which are medium and large. The brim of this hat is 4.7 inches in width, which is more than enough to cover your face, your ears as well as your neck from the harsh sun rays. 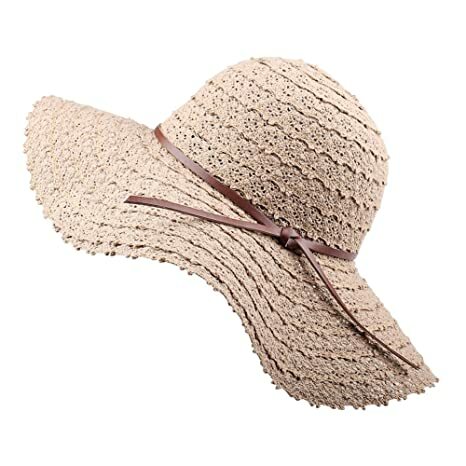 Also, the fabric of this beach hat is rated 50 + for the UPF to effectively blocking the harmful elements UVAs and UVBs and keep them away from your skin. In addition, thanks to the high quality cotton material, this hat is super cool and well ventilated. You will not feel hot at all when wearing the hat for a long time. Thanks to the soft material, this hat is foldable and packable for you to bring it along with you when you go travelling. And it is easy to care for this hat. You can wash it both by hand and with the washing machine without worrying that the quality of the hat will be deteriorate. Last but not least, this hat comes with a chin cord to keep the hat on your head no matter what. Also, this chin cord is removable. So in case you don’t need it or don’t want it, you can take it out. It is worth noting that the brim of this hat is made of cotton, which means that it is soft. Hence, it will become flimsy when it is windy outside. Its Main Features: This girl’s beach hat is made of 100 % of straw. It features the classic and traditional style of the fedora hat, including a teardrop crease, a narrow brim and a short crown. The fabric of this beach hat is rated 50 + UPF for its capability to protect your skin from the sun. There are 21 options of colors for your consideration including different contrast hat bands such as brown with black hat band and pink with black hat band. 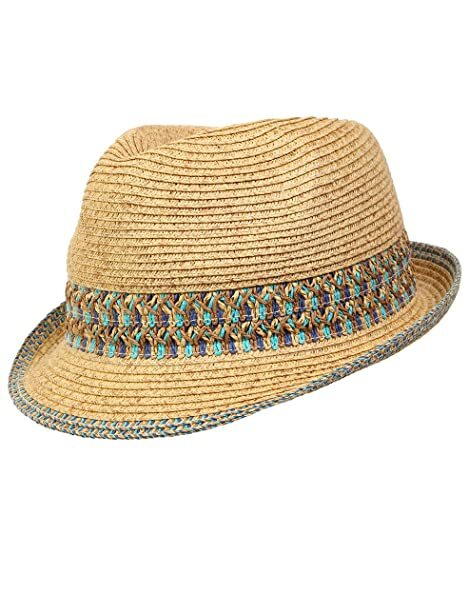 If you are looking for a unisex fedora hat with a lot of color options, you can consider this one. This hat is made of the premium quality which is cool, soft, lightweight and breathable. Not to mention that the fabric of this hat is rated 50 + UPF for the ability to protect your sensitive skin from the harsh sun rays. The built-in sweatband is super effective in case of absorbing sweat and providing extra comfort to your forehead. You would not feel discomfort or irritation when having to wear it all day long. The main problem that I have with this hat is that the hat is quite stiff with a solid construction. Therefore, it is not foldable and packable, which is a little bit inconvenient if you want to bring the hat along with you when you go travelling. Another thing is that the width of the brim is 1.5 inches. While shorter brim is better to wear in a windy day as it will not block your vision, the brim is not wide enough to protect your face as well as your neck. Its Main Features: Here comes another straw beach hat for your consideration. This one is made of 80 % of paper and 20 % of polyester. The width of the brim is 1.75 inches and the height of the crown is 4.5 inches. This hat is available in 1 size with the circumference of 22 inches along with an internal adjustable string. There are several options of colors for your consideration including aqua pattern, orange, white, hot pink and red stripes. The thing that attracts our attention about this beach hat is its vibrant and bright colors. It comes with the multi-color woven pattern on the hatband along with the pattern on the outer edge of the hat. These colors are sharp and fade resistant. They will stay in their same shades even after you wash the hat for several times. Not to mention that these colorful patterns make the hat look unique and outstanding. It is one of the most colorful beach hats that we have ever seen. You can pair this hat with your jean shorts, capris and bikini to form a much laid back and stylish style. 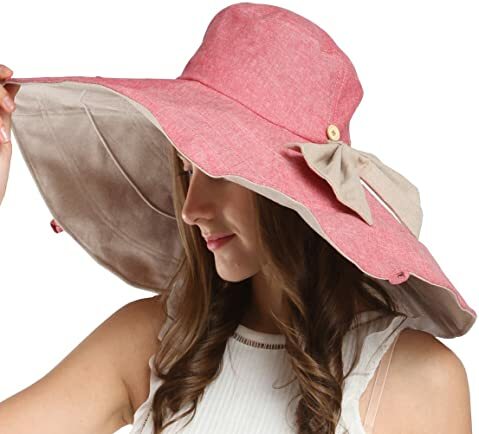 Besides its unique design, this beach hat for women has all of the features that you would need in a high quality sun hat. The material is of the top notch quality, which is soft and lightweight. Also, it is rated 50 + of ultraviolet protection factor to prevent you from getting sunburn or other skin damage under the harsh sun rays. The construction of this hat is also sturdy and solid with a shapeable brim for you to easily adjust the hat to the style that you want. 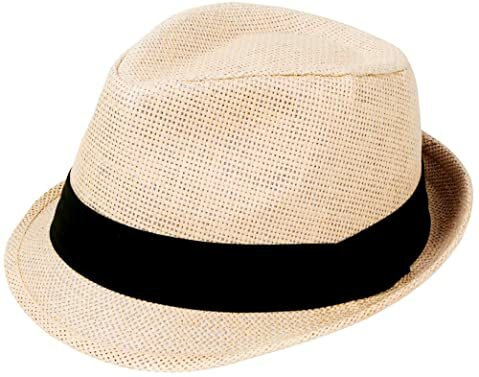 Its Main Features: This hat is made of 100 % of straw featuring the style of a wide brimmed braided hat. It also includes a wind lanyard and a hat band. You can choose from several options of colors such as ff dark brown, spring bunch tan, and pink. The brim of this beach hat has a decent width to cover a large area on your face. However, it is also quite soft. Hence, in case of a high wind, the brim will become flimsy and hence, block your view. The good thing is that this beach hat comes with a chin cord. Therefore, the hat will stay secured on your head when it is windy outside. Thanks to the soft cord attached to the hat, you can wear the hat so that it is dropped behind your shoulders without feeling like you’re being strangled. Also, in our opinion, the lanyard is cute and makes the hat look even more gorgeous. The material which is used to make the hat is of the best straw that you can find on the market. Hence, it is lightweight and breathable. Also, the straw is braided tightly enough to create a thick fabric, which is rated 50 + for the UPF to effectively protect your sensitive skin from the harsh sun rays. 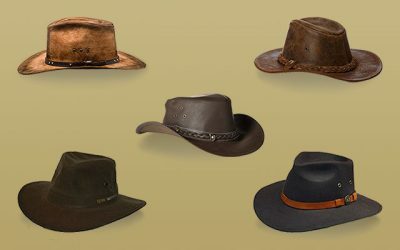 Furthermore, the hatband is made of the premium quality as well, which is capable of wicking moisture away and ensuring that your forehead will not rub against the straw material, causing irritation. Its Main Features: This beach hat is made of 100 % of cotton for the crown, the brim, and the sweatband. It also features the knitted lace ribbon. There are 6 options of colors for your consideration including khaki, beige, black, and grey. The width of the brim is 4.3 inches in width, which is decent to keep both of your head and neck from the scorching sun. There are 2 sizes for you to choose from including medium and extra large. The material of the hat is of premium quality. You will find the hat lightweight, soft and smooth when you touch it. There is an internal headband which is made of the premium cotton as well. The headband helps to keep your forehead cool and dry all of the time. Thanks to the detachable bowknot around the crown of the hat, the hat has an elegant and classy look that surely brings you a lot of compliments when you wear it. 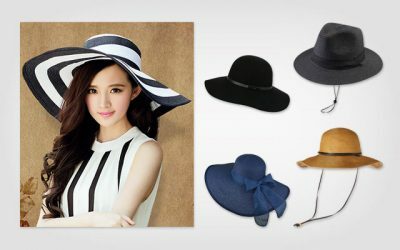 We also like the natural wavy curve of the hat, which makes the hat look even more girly and elegant. There are 2 sizes for you to choose from. In addition, there is an internal drawstring that helps the hat to stretch and fit your head more comfortably. Last but not least, like other beach hats to bring on a vacation, this hat can be folded in any way that you like and the shape would be kept. You can put the hat in your handbag or suitcase and enjoy your travel with it. Also, when you take the hat out, if creases appear on the hat, you can easily use the ironing machine to steam the hat and make the fabric flat again in a short amount of time. Its Main Features: The last beach hat I want to introduce is the one which is made of high quality straw. There are 2 options of colors for you to choose from, including beige and khaki. The height of the crown is 5 inches and the width of the brim is 2.5 inches. Thanks to the high quality straw material, this hat is very tough and long lasting. It also has a quick drying performance, which you hardly see in other hats made from natural straw. The hat is also lightweight and breathable. The sweatband is also well ventilated. And there is an adjustable tape built inside the sweatband, making it stretchy and flexible to fit your head comfortably. While the brim is not wide enough to cover a large area of your face, it can hold up to its shape pretty well, regardless of how windy it is outside. 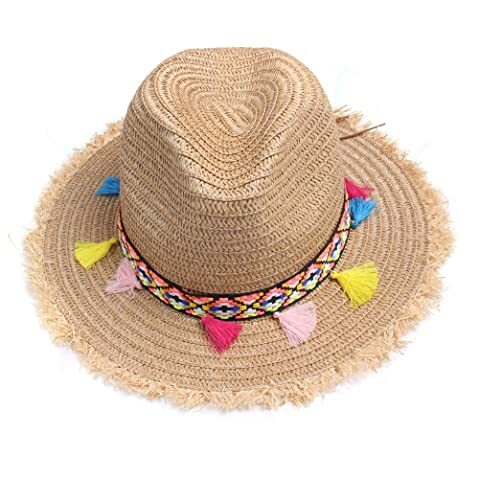 Maybe the most unique thing about this straw hat is that it has a lovely and outstanding design. The brim of the hat is decorated with various colorful tassels. These tassels are in bright and gorgeous colors that can make you stand out from the crowd when you wear it. 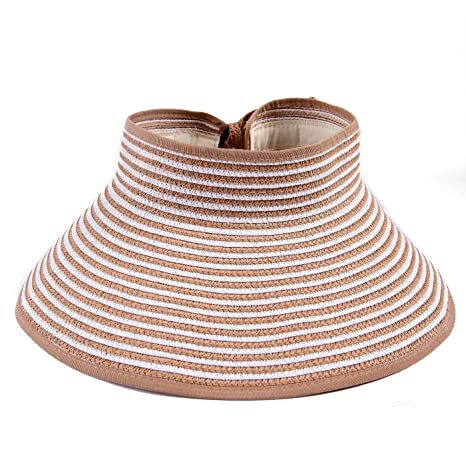 With such beautiful design, this hat can be used not only when you go to the beach but also when you go to a musical festival or take part in other outdoor activities such as recreational hiking and camping. Last but not least, this hat is well made with an exquisite craftsmanship for neat stitching lines and a firm and solid construction. You can bend the hat and pack it into a small bag for carrying around and when you take the hat out, it is still in a good shape. There are a lot of things that you need to take into consideration when choosing a beach summer hat such as materials and designs. As you can see from the list, these top rated beach hats are diverse in features, making it a tough choice for you. It is definitely worth your time searching for a suitable beach hat which is lightweight, breathable and comfortable to wear. I hope that with all of the reviews of the best beach hats for women in 2018 above, you can quickly find your most suitable hat for your next vacation. I am sure that with the stylish, comfortable and high quality hat, you will have a lot of fun time enjoying yourself on the beach. 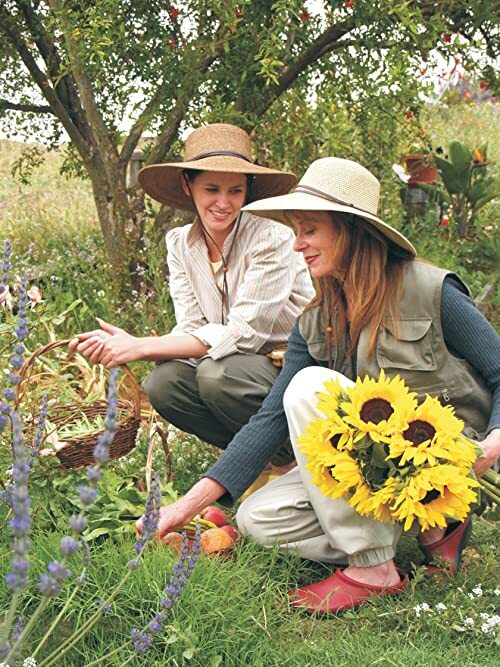 ← What To Look For To Pick The Right Sun Hats ?